Applications are due on June 14, 2013 with a decision made by June 28, 2013. This allows us nearly three months of marketing & public relations regarding the winning organization – and we expect that you will use this time to market your role in the event, and the event itself. Wewill encourage donations from all attendees at the door of the show (advertised in advance). You tell us what you need. Your completed one-page proposal must reach What a Great Event! no later than 06/14/2013. You can fax it to us at 207 / 784.3950, email it to LSnyder@regroupbiz.com or send it via snail mail. Just complete the attached form (click on the link above) but hurry – you don’t want to miss the deadline! This entry was posted in Androscoggin Pet Expo, Designated Non-Profit. Animal Rescue on a Limited Budget? 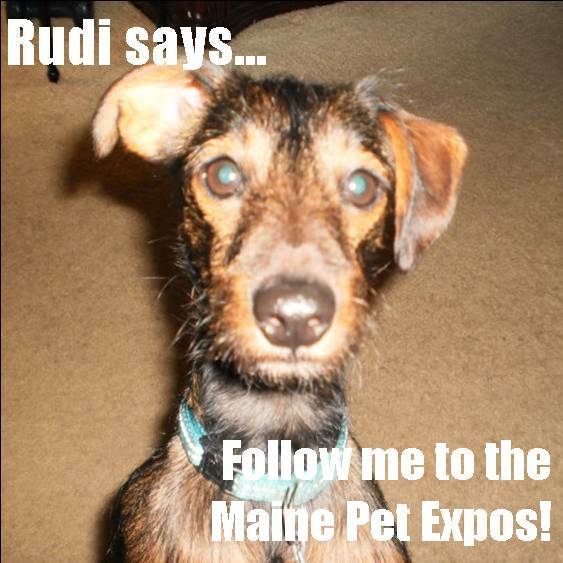 The Maine Pet Expos Offers Several Options! A member of our Facebook group (https://facebook.com/groups/mainepetexpos) just asked how a rescue could get involved and have a booth at one of our Pet Expos, even though they have very limited budgets. While those prices are a lot less than home shows and business expos charge, I know they’re still too expensive for most rescues that operate on a shoestring and depend on volunteers. f) we have a very limited need for volunteers, and will donate $10 per hour of approved volunteer time to the exhibiting non-profit of their choice (The Pixel Fund got a few dollars out of that last year, too). Another option is to come up with an idea that could help us mitigate our own costs, or would be an even exchange for expenses we already have planned… for example, if you owned a newspaper and could give me free advertising (with money I was already planning on spending), in exchange I would donate that money to the (exhibiting) non-profit or rescue of your choice. We’re more than willing to be creative, as long as we can make a living at the Pet Expos and other events we’re doing! This entry was posted in Designated Non-Profit, Volunteering. A while back I started writing The Maine Dog Blog, and got off to a great start. Unfortunately (for me, anyway), I really love writing about our dogs and those we foster for a couple of local rescues, and found that I could easily spend all my time just writing about those amazing (and sometimes amazingly frustrating) creatures we love so much. If you love dogs the way we love dogs, you might like The Maine Dog Blog. Comments, stories and pictures of your own 4-legged best friends are welcome! Early Bird rate period for sponsors (save 10%), exhibitors (save 15%) and advertisers in Show Program (save 10%). Designated Non-Profit Status proposals due. Early Bird rate period for sponsors, exhibitors and advertisers in Show Program ends. Regular rate period for sponsors & exhibitors (all are now full price). Second round of workshop and activity proposals due. Second round of workshops and activities announced. Show Program: all ads & payments are due. No refunds after this date unless a replacement is found. Show Programs printed & distributed throughout Greater Androscoggin region. Welcome to the Greater Androscoggin Pet Expo! This entry was posted in Androscoggin Pet Expo and tagged activities, Androscoggin, animal, booth, cat, dachshund, designated non-profit, dog, early bird, exhibit, expo, Facebook, fund-raise, horse, kitten, Maine, neuter, non profit, pet, pipes & drapes, pony, puppy, rescue, shelter, volunteer. Presently, in addition to our own three dogs (two of them rescues, the other a “free pup” found at a neighborhood store) we foster dogs coming out of high kill southern shelters – and have helped save the lives of more than a dozen wonderful dogs that otherwise might have had no chance. As with all What a Great Event! shows, the Greater Androscoggin Pet Expo will offer opportunities for non-profit organizations to fund-raise via volunteering and through other means. For more information, check out our Exhibitors Manual, which we can email you (contact me at LSnyder at regroupbiz dot com), or you can download it from our Facebook group mentioned above. This entry was posted in Androscoggin Pet Expo, General and tagged animal, breed, cat, companion, dog, exhibit, expo, pet, rescue, shelter.